Actually, our title is slightly misleading. Tel Lachish is not literally “in the toilet,” but there is a toilet in Tel Lachish! 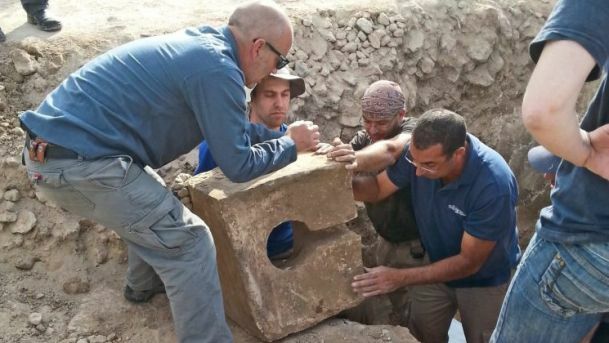 Recent discoveries at Tel Lachish, including a temple and (of all things!) a toilet, provide further confirmation of the religious reform of King Hezekiah of Judah mentioned in 2 Kings 18:4-6 and 2 Chronicles chapters 29-31. It also provides interesting confirmation of 2 Kings 10:27 which mentions the destruction of the temple of Baal and how it was defiled by being turned into a “latrine” or “refuse dump.” There are a number of ways of desecrating a temple, but certainly turning it into a lavatory is one of the most humiliating. I know what you’re all thinking: “Was the toilet ever used for it’s natural purpose?” Laboratory tests return a disappointing “no.” It appears the toilet was more symbolic than functional. 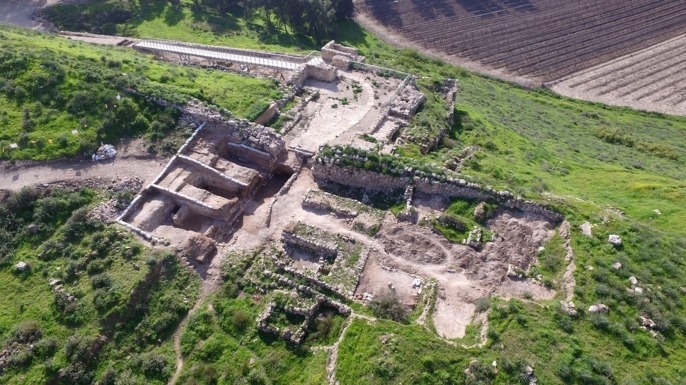 The large 6-chambered gate at Tel Lachish with the main street of the city running between 3 chambers on each side can be clearly seen in this arial photo. Photo by Guy Pitossi IAA. Our “bathroom curiosity” actually gets us ahead of the story however, and so we need to backtrack in order to understand how this discovery came about. Tel Lachish, a city of Judah about 30 miles southwest of Jerusalem in the area known as the Shephelah, is mentioned 24 times in the Old Testament. The Tel is one of the largest in Israel measuring about 31 acres. It was one of the fortified cities of Judah and considered to be second in importance, only to Jerusalem. Tel Lachish (also known as Tel ed-Duweir) has frequently seen teams of excavators since the 1930s. The site was first excavated by a British team from 1932-1938. This was followed in 1966 and 1968 with a small scale expedition by the famous Israeli archaeologist Yohanan Aharoni. Another famous Israeli archaeologist, David Ussishkin of Tel Aviv University, excavated at Tel Lachish from 1973-1994. Recently, a team under Yosef Garfinkel (formerly the lead archaeologist of the dig at Khirbet Qeiyafa, see my post HERE), as well as the IAA (Israeli Antiquities Authority) have been digging at Tel Lachish. Although the gate was discovered decades ago, it was only fully uncovered this year by the IAA. According to an article in history.com, “The gate, now exposed and preserved to a height of four meters (around 13 feet), consists of six chambers, measuring some 80 by 80 feet in total. Three chambers are located on each side, with the ancient city’s main street running in between them.” It is the largest gate ever uncovered in Israel that dates to the First Temple Period (the time of Solomon to the exile). The first chamber in the gate revealed benches with armrests, a vivid reminder of the Bible’s description of the judges and elders of a city sitting in the gate (e.g., Gen. 19:1; Prov. 31:23). Gates of ancient cities were also known to have temples or shrines to their god contained in them. An example of this is recorded in 2 Kings 23:8 which tells us that King Josiah of Judah, “broke down the high places at the gates.” The rest of the verse goes on to describe one of these high places being at “the entrance to the gate.” So we should not be surprised to hear that the IAA discovered one of these “temples” within the city gate of Tel Lachish. 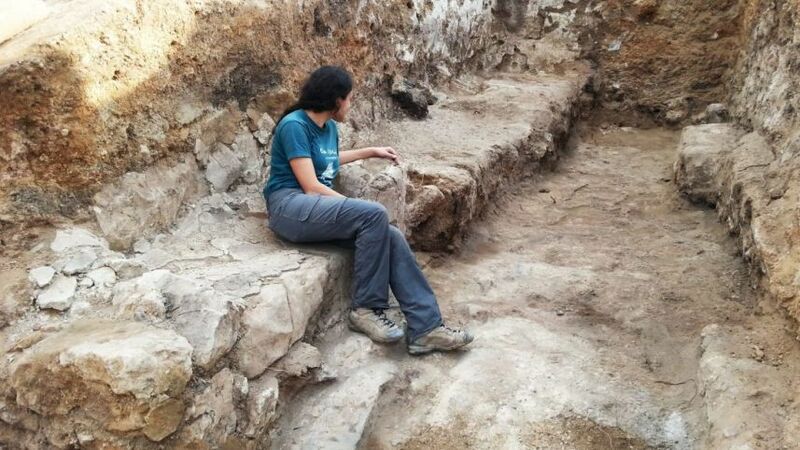 Here is a description of the discovery by Sa’ar Ganor, the director of the IAA excavation: “Steps to the gate-shrine in the form of a staircase ascended to a large room where there was a bench upon which offerings were placed. An opening was exposed in the corner of the room that led to the holy of holies; to our great excitement, we found two four-horned altars and scores of ceramic finds consisting of lamps, bowls and stands in this room” (read more: http://www.haaretz.com/israel-news/1.744861). The altars had the horns broken off; another sign of temple desecration. Watch Sa’ar Ganor’s explanation of the discovery at the following youtube link HERE. Other items discovered included jar handles labelled “lmlk” (belonging to the king) with a depiction of a four-winged beetle (scarab). Both of these markings are commonly associated with the reign of Hezekiah, being found in other excavations of this time period. 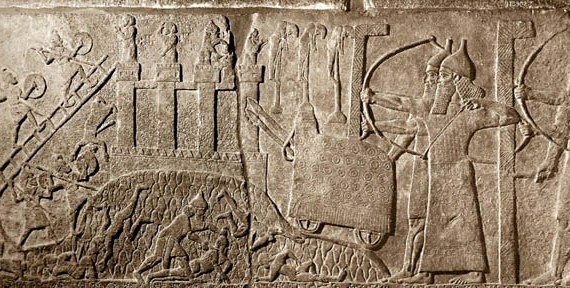 One of the wall panels depicting the conquest of Lachish by Sennacherib. The entire panel is on display in the British Museum. Tel Lachish has long been famous since the discovery of a wall panel in the palace of Sennacherib, the Assyrian king, depicting its conquest in 701 BC. For a 3D depiction of the entire panel watch the short youtube video HERE. The Assyrians built a very impressive ramp in order to scale the walls of the city which can still be seen today at Tel Lachish. Numerous pieces of armor, arrowheads, and stones (from slings) have also been recovered, a reminder of the ferocity of the battle. It would be expected that the excavation of the large gate complex by the IAA would also yield evidence of the battle and indeed it has with the discovery of more arrowheads and sling stones. 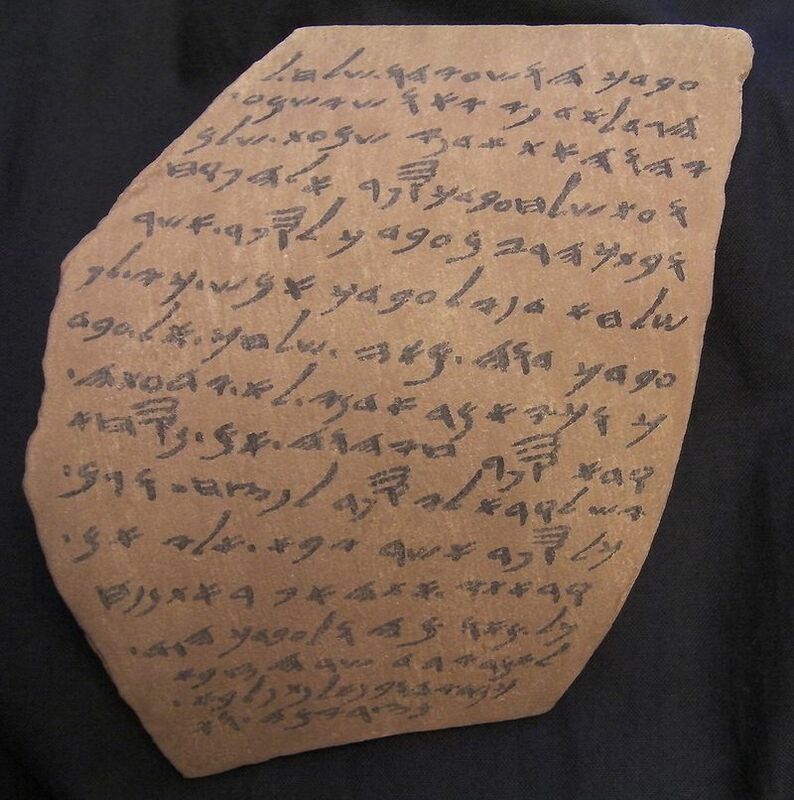 A replica of one of the Lachish letters. May Yahweh give you good news at this time. And now, your servant has done everything my lord sent (me word to do). I have written downj everything you sent me (word to do). As regards what my lord said about Bet-HRPD, there is no one there. The last few words of the letter state that the fires of Azekah can no longer be seen, which many interpret to mean that the Babylonians had destroyed Azekah, and thus would be marching on to attack Lachish. This statement recalls a passage in Jeremiah 34:7 which reads as follows: “When the king of Babylon’s army fought against Jerusalem, and all the cities of Judah that were left, against Lachish and Azekah; for only these fortified cities remained of the cities of Judah” (emphasis mine). A comparison of this text with the Lachish letter above sends a chill up the spine as the reader realizes that contrary to Jeremiah 34:7, this letter asserts that only Lachish is now left! With a large portion of the Tel yet to excavate, we await further findings of this fascinating city. Meanwhile work is being done at Tel Lachish to make it more tourist friendly by turning it into a National Park. For more on Tel Lachish, check out the following links. For an aerial view of the Tel click HERE. For another short video of the recent discoveries (without commentary) click HERE. For more about past work at Tel Lachish you can see the website at Tel Aviv University. Finally, my cyber buddy Luke Chandler is currently working with the excavation at Tel Lachish and shares an article about the recent discoveries HERE.